Unique asymmetric bracelet made entirely by hand in oxidised and polished fine and sterling silver. 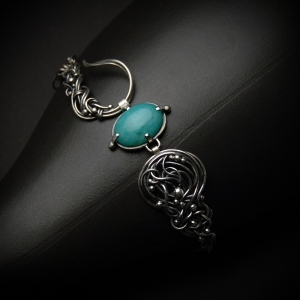 A gorgeous oval amazonite cabochon graces the ornate part and a triple fancy handmade chain softly embraces the wrist. The bracelet fits perfectly a wrist of 18cm of circumference - it can be shortened or elongated upon request.